The You Me Sushi Westfield branch is a small kiosk where weary shoppers can come and refuel with some delicious and fresh takeaway sushi. Customers can come and take the weight off and enjoy some maki rolls, teriyaki dishes or some of our very popular chicken katsu curry. 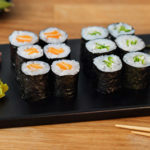 You Me Sushi is located on the first floor of the Westfield shopping centre and our customers can enjoy their sushi takeaway or sitting in. We are open as often as the shopping centre is but as a guide we have include our times below. Pop in and enjoy!